3 Steps to Planning the Perfect Girls' Trip. There are few things that I love more than a girls' trip. Not only is is fun to discover a new place (or discover new things to do in a favorite destination that you've been to before), but it's even more enjoyable when in the company of good girlfriends! Some of the most special memories that I have with my friends were made on girls' trips. My Charlottesville friend group and I recently got back from our first girls' trip- which was a weekend in Charlotte, NC! I lived in Charlotte for four years (for college and a bit after), so it was so fun to bring my friends from post-grad life to a city that's not only special to me, but also has a lot of fun things to do for a weekend trip. (In tomorrow's blog post, I'll be sharing everything we did in Charlotte!) All of us had a great time, and we're already chatting about doing a beach trip sometime this spring or summer. 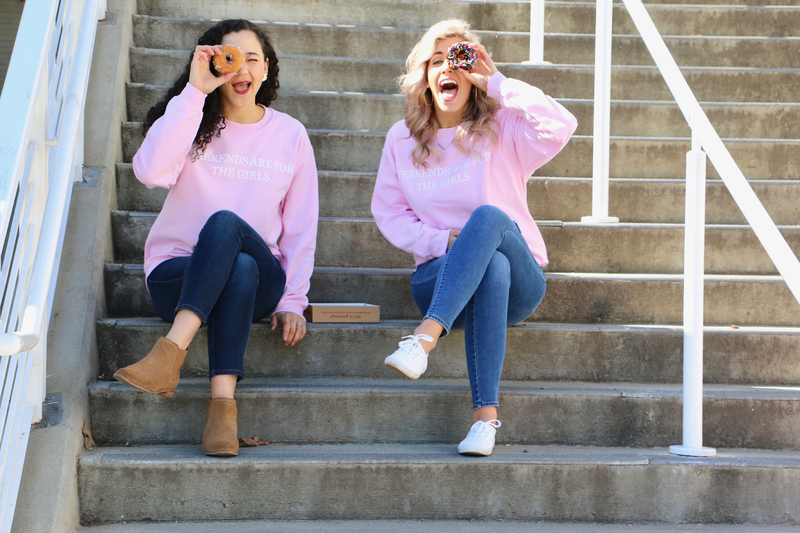 I'm so excited to be teaming up with Custom Ink in today's blog post, to share how I designed and ordered some adorable matching sweatshirts for my friends and I to take on future trips, as well as a couple tips to plan the perfect girls' trip! Today's post is sponsored by Custom Ink. All opinions are honest and my own. Thank you for supporting the brands that support Southern Belle in Training! Tip #1: Plan in advance - There are so many advantages to planning a girls' trip far in advance! It'll be easier for everyone to request the time off of work or school, you're more likely to find cheaper rates on air travel (if needed) and lodging accommodations, and it gives everyone going something to be looking forward to! While spontaneous travel with your girlfriends can be fun, oftentimes trips at the last minute can have some hiccups. Here's a perfect example of that: when I lived in Vermont, my friend Anna and I planned a very last minute weekend trip to Lake Placid, NY. While we still had fun together, I wish that we had planned it more in advance, because we didn't know that an Ironman Triathlon was happening downtown while we'd be there, which means that a lot of the roads in town and popular local attractions were closed! Tip #2: Find out everyone's budget - The more people going on the trip, the more important this is! A girls' trip wouldn't be fun at all if you or a friend of yours end up having to shell out a lot more money at the last minute then you originally planned. The more people coming on the trip, the more you'll have to compromise to fit everyone's budget. But the plus side of a lot of friends coming on the trip is that more people means more chances to share lodging and transportation costs, which can make it cheaper for everyone. Budget related things to ask your friends before planning your girls trip: how much is everyone comfortable for spending on transportation, lodging, meals, and excursions. My recent girls' trip to Charlotte ended up being pretty reasonable budget-wise. We took two cars from Charlottesville, and everyone chipped in for gas and shared Ubers in Charlotte. I selected fairly cheap restaurants for meals on the trip, and also planned some free activities, so overall it ended up being a pretty budget friendly weekend, but still lots of fun! 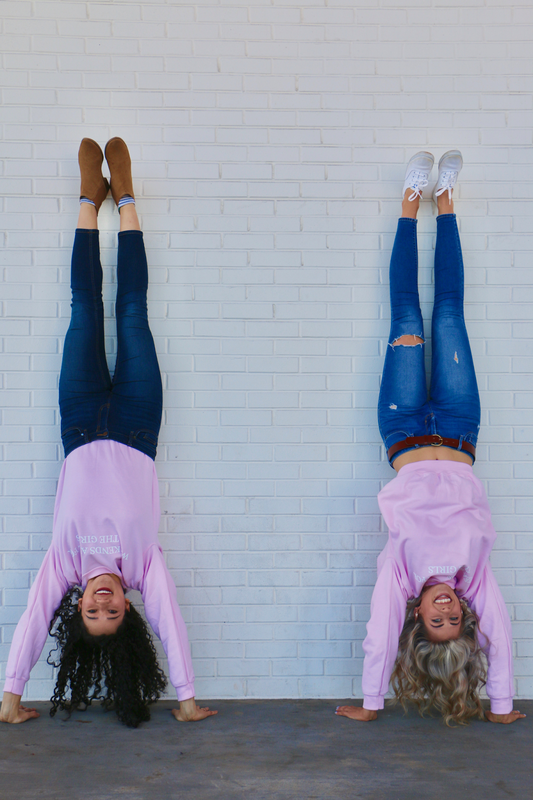 Tip #3: Get custom apparel for your trip from Custom Ink: There's something so fun about wearing something coordinating or matching with your girlfriends on a trip. Whether it's bachelorette party t-shirts with sassy sayings on them, cute matching baseball caps or sun hats for a beach trip, or adorable matching sweatshirts, the possibilities are endless! 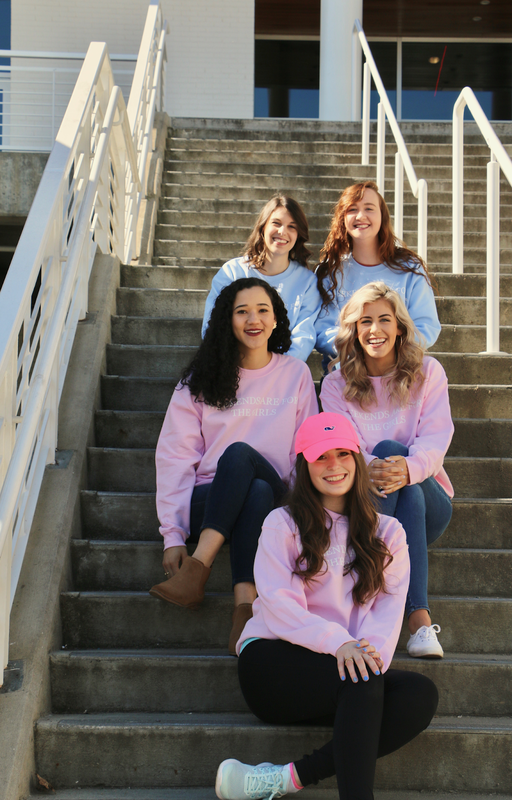 Not only is it adorable to match all of your friends for some photos on your trip, but ordering custom apparel for a girls' trip is essentially having a built in souvenir to keep after the trip! Each time that you wear that item going forward, it'll bring back fun memories of your travels. 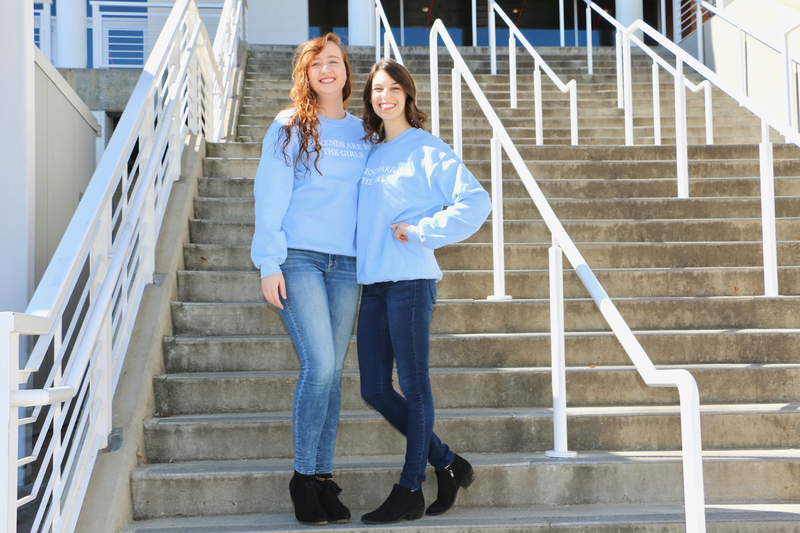 I'm so excited to share the cutest sweatshirts that I designed and had made through Custom Ink for my Charlottesville friends! 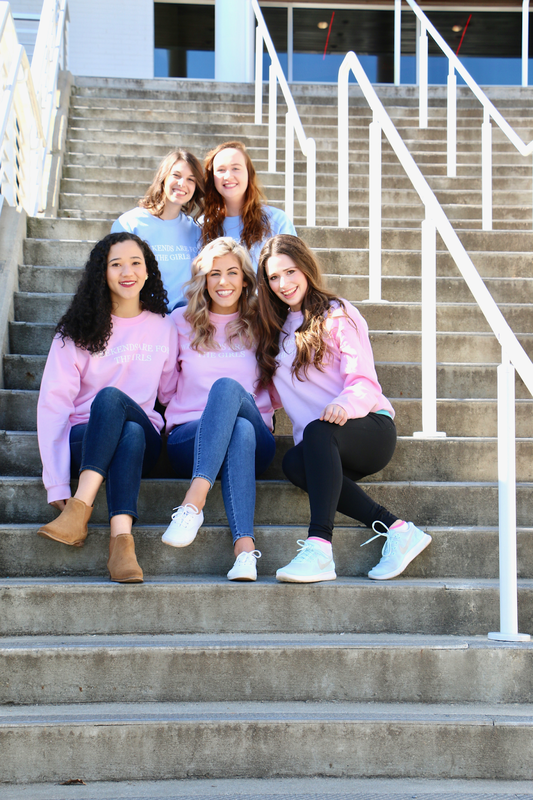 When I thought about all of us wearing matching apparel, I envisioned cute crewneck sweatshirts with a saying on them that would be perfect to re-wear after the girls' trip. While it would've been fun to put an inside joke or something specific about our Charlotte trip on them, I didn't think that would be practical to wear on future trips (or just to re-wear), so I began searching for cute graphic t-shirt quotes. I knew I'd found a winner with the saying "Weekends Are For The Girls"! 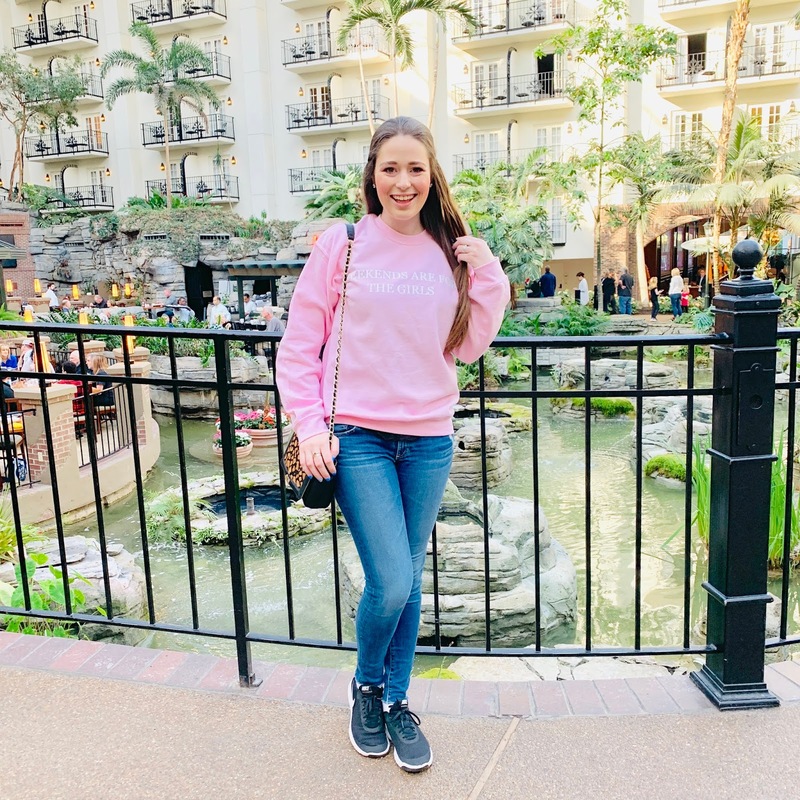 This saying totally applied to a girls' trip (and will for future trips as well), but I knew it was also the perfect saying for a sweatshirt that myself or one of my friends would enjoy wearing regularly, without the company of everyone matching! A true win-win. I loved using Custom Ink to create matching apparel for my friends because of how many options they had! The Custom Ink Design Lab gives you free access to a library of 400 fonts, 7,500 editable templates, and 70,000 pieces of art! Think of all the cool customizable options you can create with that many design options. 😊There are also 1,000+ apparel options! Everything from t-shirts, tank tops, sweatshirts, pants, raincoats, and many more apparel choices and accessories. I knew that I wanted to make everyone crewneck sweatshirts, so I found it really cool that Custom Ink had so many colors and style options just for crewneck sweatshirts alone! I placed my bulk order for the sweatshirts through the Custom Ink website, which I found very easy to use, but you can also make orders in their stores, by working with their knowledgable team! If you visit a Custom Ink store, you'll have the opportunity to view samples of apparel and accessories in person before placing your order. Custom Ink has stores in seven states, and 12 locations in Virginia! There are store locations in Charlottesville, Fredericksburg, Carytown/Richmond, and many locations in NoVa (Northern Virginia). I placed my order online, but did an in-store pick-up at the Charlottesville location, which was easy and convenient. Have you ever used Custom Ink before to make custom shirts, apparel or accessories for a group event? If you're headed out on a girls' trip (or especially a Bachelorette trip!) anytime soon, I highly recommend you look into them- as it's so easy to create a fun design for a bulk order. Stay tuned for tomorrow's blog post, where I'll be sharing more about the itinerary for the Charlotte girls' trip that I planned! Oh my goodness these shirts are sooo cute! Matching t-shirts are a MUST for girls trips. I completely agree with all of these tips. I’ve been on a girls trip where we didn’t ask each other’s budget and I spent wayyyy more than I would’ve liked to. You know how much I adore girl's trips (and all things matching!) So this post is basically my favorite!! You and your girls are so cute & I can't wait to check out Custom Ink for my next trip! Super fun touch to add some custom gear to the mix! Love the idea of having matching custom gear. So cute! These sweatshirts are adorable! These are SO fun! Perfect for a girl's trip or bachelorette party! The BEST Shein Buys for Spring/Summer. My Best Budget Travel Tips! My Favorite Time of Year + White Lace Dress.